Today, We are going to discuss how to Integrate TinyMCE editor with php or html. TinyMCE editor is web based WYSIWYG editor which enables you to convert HTML textarea field to an editor. The TinyMCE editor is converting the formatted text into HTML. Basically it helps to display formatted HTML code. 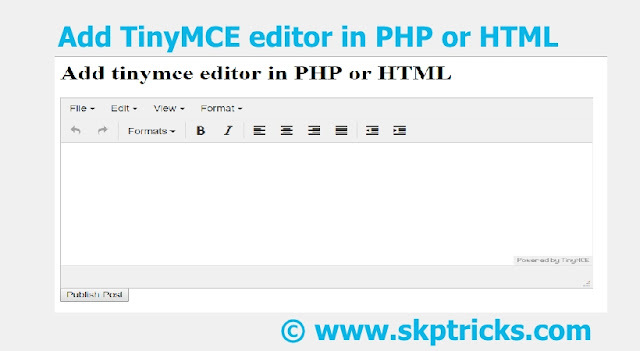 Here we have given simple example how to add TinyMCE editot in php or html file. To use this editor you need to download some important files from the TinyMCE editor official sites. Follow the below steps to add TinyMCE editor in PHP or HTML file. lets see the complete example, which helps to you display formatted HTML code. This is all about TinyMCE editor. Thank you for reading this article, and if you have any problem, have a another better useful solution about this article, please write message in the comment section.